John Tlumacki/The Boston Globe via Getty Images(NEW YORK) -- Former President George W. Bush has accepted an invitation to deliver a eulogy at the funeral of Sen. John McCain at the National Cathedral and is "honored to have been asked to speak," Bush spokesman Freddy Ford confirmed to ABC News on Sunday. Former first lady Laura Bush will also be in attendance. McCain, a Vietnam War hero with more than 35 years of public service who became one of the most distinctive figures in modern American politics, died Saturday at his home in Arizona at the age of 81 after a long battle with cancer. 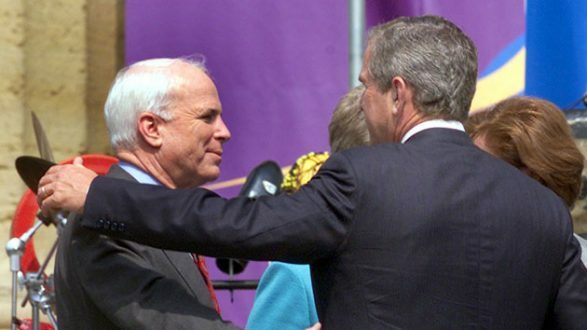 The New York Times reported on Saturday night that McCain requested that both Bush and former President Barack Obama — each of whom has run against the Arizona senator in presidential campaigns — be invited to deliver eulogies at the senator's funeral. The Times also reported Saturday that while Vice President Mike Pence was invited to attend the funeral, President Donald Trump, who has had a tumultuous relationship with McCain, was not invited. ABC News has reached out to the White House and Obama's representatives, but a request for comment was not immediately returned. McCain has a long history of reaching out to lawmakers across the political aisle to pass major legislation in the Senate and of overcoming political differences. The Arizona senator lost to fellow Republican George W. Bush in the 2000 GOP primary for president. Bush paid tribute to McCain on Saturday, writing, "Some lives are so vivid, it is difficult to imagine them ended. Some voices are so vibrant, it is hard to think of them stilled. John McCain was a man of deep conviction and a patriot of the highest order." Obama, who defeated McCain in the 2008 presidential election, offered his condolences to the McCain family and shared a heartfelt tribute to the Arizona senator in a statement on Saturday. “John McCain and I were members of different generations, came from completely different backgrounds, and competed at the highest level of politics,” he wrote. “But we shared, for all our differences, a fidelity to something higher — the ideals for which generations of Americans and immigrants alike have fought, marched, and sacrificed. McCain's fellow Arizona senator, Republican Jeff Flake, said on This Week Sunday that McCain's greatest lesson is “to forgive” and “to see the good in his opponents." Flake added that we can honor McCain's legacy by "seeing the good in our opponents, by being quick to forgive, by realizing that there's something more important than ourselves, to put service over and above our self interest."